Selection Cycles of Paris was an upmarket bicycle manufacturer. 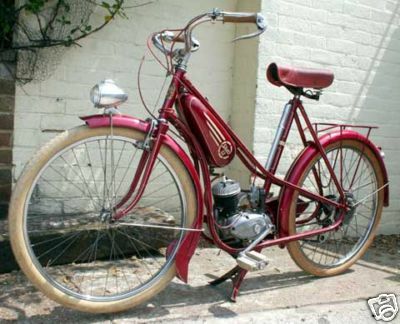 Whereas we may now look down on mopeds as cheap vehicles for people who can't afford a motorcycle, in the early fifties some of them were actually expensive machines that were more upmarket than motorcycles. Manufrance made a more utilitarian version if your needs were just for basic transport, but if you wanted a stylish moped to potter around the south of France, you bought a Rocher Cucciolo or something like this. It has a le Poulain engine; this company supplied proprietary engines for many different cyclemotor companies, either front-mounted over the handlebars (their first models) or centrally mounted such as this one. These engines enjoy a good reputation and spares are not hard to find. The name is stylishly displayed on the crankcase. There is a strange damping mechanism set up on the handlebars so that when you press down on them it provides some sort of suspension.